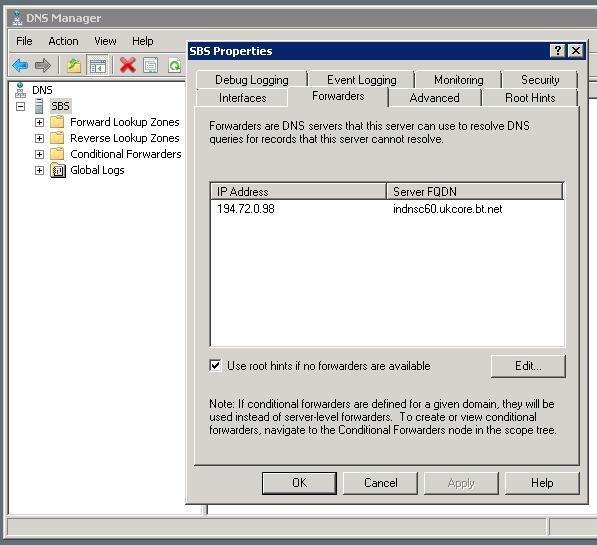 After one day, you may find your Windows 2008 DNS Server is unable to resolve names in some top level domains (TLD’s) like .co.uk, .cn, and .br when it is configured to use root hints. This may also be seen with other top level domains too. According to Microsoft, a network monitor trace should show that the DNS Server does not send any DNS traffic out to the internet. The Windows 2008 DNS server returns SERVFAIL to the client or when using nslookup. I have not used Network Monitor to verify this myself, but I am sure if you loaded it up and used this MS KB to set up a trace that you would be able to verify this symptom. Workarounds include restarting the DNS server, clearing the DNS cache, setting maxcachettl to 2 days or greater, and using DNS Forwarders instead of root hints. This currently occurs with default SBS 2008 installs that have been configured to use root hints for DNS lookup. I have recently noticed this behaviour myself with two different SBS 2008 installs. 6. Restart the DNS server. 1. 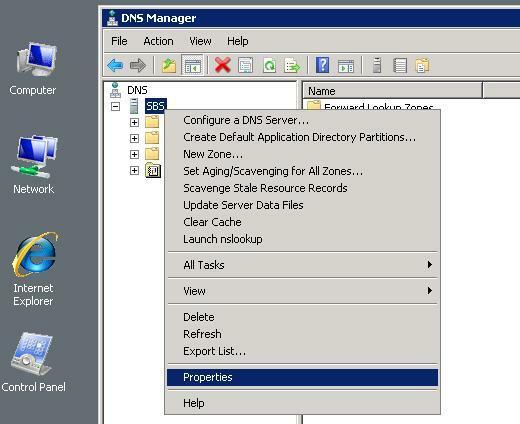 Open up DNS under Administrative tools from the SBS server’s start menu. 2. Right click on the server name and select Properties. 3. Go to the Forwarders tab and click on the “edit” button. 4. Enter the primary DNS address of your ISP (In this case mine was BT so I used 194.72.0.98) and click Ok.
5. The forwarders section will now attempt to automatically resolve the FQDN for that IP. (Note you can also probably enter your router’s IP address in the forwarders section which should then get your SBS to look to the router for DNS information). 6. Click Ok to close the properties window and then close your DNS console. DNS lookups for the TLDs should now be working again. If not, stop and restart DNS or give the server a reboot. Extremely nice to know I’m not alone, but did you ever find a *solution*? These work-arounds don’t help me. Having to monitor when the issue occurs so I can restart DNS is not an option. Using forwarders isn’t either because we use 2 internet lines, from different ISPs and fail-over and load balance on them. I can thus not use the ISPs as the SBS server does not know what ISPs line it will be using. Public DNS servers frequently have issues with RBLs, which we use heavily, so it kind of ends there. The root hints always worked like this on 2003 servers. What’s more disturbing is that it doesn’t go away once it occurs either. You actually need to restart the damned thing. Since this issue is a year old, that doesn’t seem very promising either… We have all updates installed. I’ve also run into this problem using Windows Server 2008 and Windows Server 2008 R2. You normally just need to clear the DNS cache to get the DNS server to resolve TLDs again. I “resolved” this problem by creating a scheduled task to clear the DNS cache every day. Thanks for the comment Xavier. How exactly did you get the DNS cache to clear via scheduled task? I’d be interested to know the the solution you used. Sorry for the slow response Sean. Thanks for the reply Xavier. Great WMI script you have there and thanks again for sharing! Bruce! Indeed you did bud 🙂 Glad it came in handy all these years later! thanks for the post. While the registry edit that the MS KB provides does fix the issue, I am still looking for a reason why this is occurring on some systems and not others. Has anyone found the actual cause of this issue? I have not found the actual cause myself. If I find myself dealing with an edition of SBS again in the future that still has this issue I will most certainly try to dissect it and figure it out. What version / edition of SBS are you running out of curiosity? I am interested to know if this is still an issue on later versions (after SBS 2008). Hi Sean. As they said in the movie Apollo 13, “You sir, are a steely eyed missile man”. Thank you so much for this DNS fix. I was pulling my hair out for days because this problem was causing outgoing email to get stuck in my Exchange server’s outgoing queue for up to a day for some domains because the Windows Server 2008 DNS service would refuse to resolve those names. Sheesh! Didn’t have this problem with Windows Server 2003! Haha, great quote! The highest of compliments from NASA. Not so sure I deserve all the credit as I am just passing on the fix and my experiences in this post, but thank you none the less kind sir!